The BJP sweep in the state-level elections in India last week is, quite possibly, a foreshadowing of what is to come in the national election next spring. The confidence of my lefty friends that Narendra Modi will not be the next Indian prime minister may have been more wishful than realistic. With that in mind, I wanted to write a few lines on the prospect of Narendra Modi as PM. We should be clear-eyed about what the BJP revival means, and what it does not mean. It does not mean a new wave of Hindutva and anti-Muslim bigotry. Antipathy towards Muslims has not gone away – far from it – but there has been no spike, no reprise of the hysteria of the early 1990s, with its bizarre ‘chariot rides’ and spectacular vandalism. The recent ‘riot’ in Muzaffarnagar was reprehensible, but it was nothing like the carnage in Bombay in 1992 and Gujarat ten years later. The BJP victories are about other, more prosaic things: the economic slowdown, the glamor that Narendra Modi has acquired as the messiah of corporate India, and above all the dismal performance of the UPA government. Had Manmohan Singh stepped down after his first term in office, he might justifiably have been remembered as an effective prime minister who had followed through on a coherent agenda of governance. But in his second term, Manmohan has become something between a joke and a sad apparition: a man asleep at the wheel, or not even behind the wheel. The responsibility for this state of affairs is mostly Sonia Gandhi’s, who has done to Manmohan what Putin did to Medvedev, but that simply underlines the reality that the PM is not responsible even for his own disappearance. Meanwhile, the Gandhi family has offered nothing of substance except corruption and arrogance, hounding a bureaucrat who blew the whistle on shady land deals and trying to preserve the status of Parliament as a safe-house for criminals. The BJP is just as corrupt and high-handed, but has the advantage of being in the opposition. Given Manmohan Singh’s vanishing act, the climate is right for a new politics of omnipresence, i.e., an emphasis on personal leadership. So we have Rahul Gandhi versus Narendra Modi, which is arguably a presidential rather than parliamentary confrontation, consistent with the Indian middle class’ aesthetic preference for America over Britain. In that confrontation, Rahul Gandhi is at a disadvantage, because although he has had more than enough time in the limelight to establish himself as ‘leadership material,’ he has been either too lazy or too unintelligent to do so. It is, I think, the former. What Rahul says – about criminals in Parliament, about the Muzaffarnagar atrocity – suggests the existence of insight and even principles, but they also suggest a terrible lack of consistency and organization. Modi, on the other hand, is nothing if not focused and organized: a man who knows what he wants and leaves no doubts about his seriousness. He will never win a majority of votes in an all-India election, but given the uninspiring opposition, he might win just enough to be the dominant figure in a new governing coalition. Modi appears to fulfil a long-standing fantasy of a segment of the Indian population – the urban middle class – that, while beleaguered by the rise of subaltern and semi-subaltern voters, still retains the power to articulate the template of national leadership. What this class has wanted since the turn of the last century is a particular type of man at the head of the nation: a man capable of the well-informed, clear-eyed, rational and decisive use of violence. That capability, after all, is at the heart of the liberal nation-state that emerged from Bismarck’s Europe. In India, the ‘man’ who best represented this ideal in the PMO was Mrs. Indira Gandhi, but Vajpayee, Nehru and even Shastri came close. Modi’s apparent proximity to this model of statesmanship is misleading. He is fundamentally a provincial man, without the worldly education and historical awareness required to represent or even understand the national interest in the world. His amply-demonstrated capacity for violence is suited not to the calibrated deployment of naval squadrons but to street-fighting, i.e., to the petty viciousness of domestic politics and organized rioting. 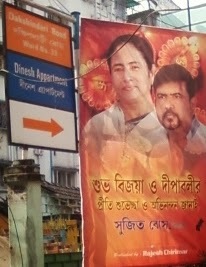 Even his style – the garish fancy-dress, the gratified acceptance of the worship of supplicants – is easily recognizable as the aesthetic of provincial politics in India, reminiscent of southern film-star politicians, Mayawati’s pink elephants, and Mamata Banerjee’s zeal in covering Calcutta with posters and billboards of herself. In thirty years of Left Front rule in West Bengal, Jyoti Basu and Buddhadeb Bhattacharya never became so omnipresent in the public eye, but they were liberal, middle-class politicians. (There were images of Mrs. Gandhi everywhere in Calcutta in the 1970s, but they were mostly cartoons drawn by the communists. Now, of course, cartoonists and communists are both visited by the police.) Mamata, Mayawati, Modi and the Southern gods represent what might be called a subaltern take on fascism. It’s not the real – i.e., 'European' – thing, either as fascism or as liberal democracy, although it has elements of both. Modi as PM would be just as prone to triggering fits of nervous laughter as Mamata Banerjee has shown herself to be. But even subaltern fascism must be taken seriously as a dangerous political product. The biggest difference between Modi and Mamata, obviously, is Modi’s barely disguised hatred of Muslims. This is not necessarily his best selling point, but many voters who are uncomfortable with it have learned to accept it as an incidental imperfection in an otherwise desirable package of right-wing economic policies. Many more take for granted that being anti-Muslim is the core of right-wing nationalist ideology in India. Yet right-wing Indian political thought has a long, parallel history that is not anti-Muslim. We can trace that history not only to Benoy Sarkar and more problematically, Subhas Bose (who was both of the left and of the right), but as far back as the essayist Bhudeb Mukhopadhyay, who was Bankim’s contemporary. Bhudeb was a self-identified conservative; his views on the Hindu family, Indian womanhood, caste, and the relationship between society and the individual were consistently reactionary, although not anti-modern. Indian nationhood was real and distinctive, he argued, and sought to recover and conserve the distinctions. Like Bankim, he was uneasy about Muslims: their extra-Indian enthusiasms were too evident for his liking. But he also insisted that Hindus and Indian Muslims belonged to a single moral and social world, that Indian Muslims had more intimate bonds with Hindus than they did with Arabs, Iranians and Turks, and that Islam would become progressively indigenized in India until Muslims were no more alien than Jains and Sikhs. In this, he preemptively rejected a basic premise of Savarkar’s Hindutva: the notion that India was the exclusive punyabhumi or sanctified homeland of some religious communities but not others. Bhudeb’s Hindu conservatism did not prevent him from teaching in a madrasa, and from regarding the ulema with deep empathy and respect. He recognized the social and political divides between Hindus and Muslims in his own time, but pinned the blame firmly on Orientalist scholarship (history in particular). He placed the major responsibility for bridging the divide upon his fellow-Hindus, who were, he recognized, already the economically and politically dominant community. In this, he foreshadowed Benoy Sarkar, although unlike Sarkar, Bhudeb wrote at a time when the ins and outs of Indian nationhood were still falling into place. What Bhudeb, Benoy Sarkar and Subhas Bose acknowledged, and Bankim, Savarkar and Golwakar did not, is that an Indian nationalism that is anti-Muslim at heart is fundamentally self-defeating; it cannot be otherwise. No state that excludes, demonizes or discriminates against thirty percent or even twelve percent of its population can be stable, peaceful or effective, especially when twelve percent adds up to well over a hundred million people. Such a country will remain at war with itself and crippled by that war. And that war is precisely the sort of provincial, primitive use of rusty swords and tridents that sustains a politician like Narendra Modi. It features secular citizens slipping into a rhetoric of ‘us’ and ‘them’ in casual conversation, landlords rejecting prospective tenants because they are Muslim, of harassment by the police of a man with the temerity to marry a Hindu woman, ‘encounter killings’ of college students, and the occasional pogrom. It is far removed from the grand visions of global strategy that the Indian national elite has entertained since Bankim turned Krishna into Bismarck. The irony of the middle class’ willingness to embrace a small-time bigot like the murkhya-mantri of Gujarat is precisely that it diminishes its own pursuit of the global big time: a place in the sun, credible and projectable power. It reduces would-be giants to dwarfs. India with Modi as prime minister will probably not be Nazi Germany, but it will be a small-town circus complete with animals and clowns, in which jackals imagine they are lions (from the Gir Forest, naturally).